The pace of oil and gas exploration is frightening, and discoveries are weekly, if not daily, with volumes investors would only have dreamt of a decade ago. With each new discovery, it becomes difficult to keep track of the playing field, and even more difficult to rank the potential. There are also a lot of juniors popping up on the scene now, exploring, finding and developing with the intent to lure the bigger players to buy them out. So we’ll make it easy for you here, with our list of 6 key oil and gas discoveries so far this year, followed by a short list of the companies we think have the best potential—and they’re not necessarily the ones who have made the biggest discoveries. 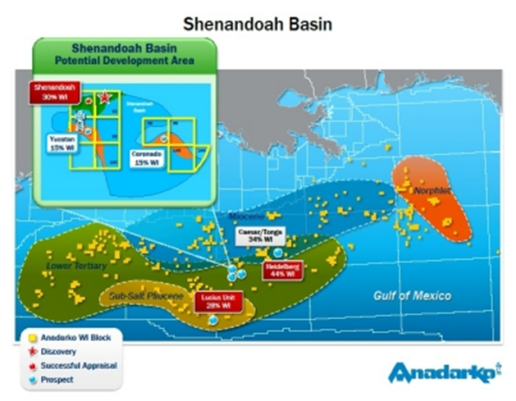 In mid-June, Anadarko Petroleum (APC) announced a major new discovery in this deep-water play: more than 500 million barrels of crude oil in the Shenandoah-2 well. This find is important: the implications are massive and this means we could be looking at a major oil rush in the Lower Tertiary trend. (Anadarko shareholders should be thrilled). And it wasn’t easy (or cheap): Anadarko drilled through some six miles of rock in water at a depth of 5,800 feet. The Lower Tertiary trend and its sub-regions could hold up to 15 billion barrels of oil. What this discovery means is that the US oil boom is far from over, and the Gulf of Mexico Lower Tertiary trend is still surprising us. Anadarko’s find solidifies a trend that began with ExxonMobil’s 2010 discovery of the Hadrian field (700 million barrels); Royal Dutch Shell’s discovery of the Appomattox field (500 million barrels); Chevron’s discovery of the Moccasin field (200 million barrels); and BP discovery of the Mad Dog field (est. 4 billion BOE). In May, Chevron Corp (CVX) announced a new discovery at its Coronado prospect in the Gulf of Mexico, at the Walker Ridge Block 98-1 well. The well is some 190 miles off the coast of Louisiana in the Lower Tertiary sub-salt trend, in water of around 6,127 feet, but it’s been drilled to a depth of 31,866 feet! (One of the deepest wells ever drilled and probably cost at least $250 million, though we don’t know for sure). The scale of the reserves is still under appraisal for commercial viability, and Chevron currently holds a 40 percent working interest in the prospect. Other owners of the Coronado prospect are ConocoPhillips ( COP ) with a 35 percent stake, a subsidiary of Anadarko Petroleum Corp. ( APC ) with a 15 percent stake, and Venari Offshore LLC with a 10 percent stake. In mid-June, Norway’s Statoil announced it was evaluating a new discovery of high-quality oil off the coast of Newfoundland, about 500 kilometers northeast of St. John’s. The Harpoon discovery is under some 1,100 meters of water. While we don’t know the extent of the Harpoon discovery just yet, what we like is that it is only 10 kilometers from the earlier Mizzen discovery, which is estimated to hold between 100 million and 200 million barrels of oil. Statoil owns a 65% stake in Harpoon (the rest is owned by Husky). 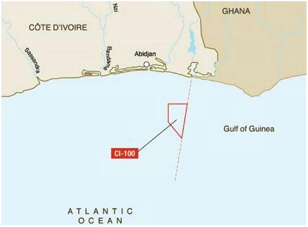 In late April, France’s Total SA announced a major discovery in the deep waters off the western coast of Cote d’Ivoire, encountering 91 feet of net oil pay while drilling in Block CI-100 in about 7,400 feet of water. It was the first block Total drilled. What is significant about this discovery is not the net feet of pay, but the fact that it confirms an extension of reserves in the Tano basin, home to the giant Jubilee field in neighboring Ghana. The Jubilee field is one of the richest oil fields in Africa with potential reserves eclipsing 1.8 billion barrels. This is the second major find in Cote d’Ivoire recently; last year Tullow Oil—which is also exploring in Ghana, made an offshore discovery here as well. In April, Statoil said it could be sitting on 40-150 million recoverable BOE in the North Sea in its Gullfaks license, where it is still working to confirm its findings. Gullfaks is in the North Sea’s Shetland Group/Lista Formation. 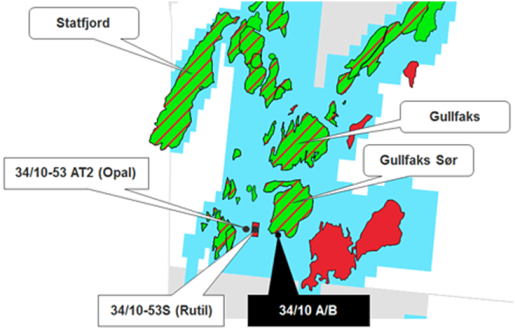 The Gullfaks finds are younger, shallower deposits than its primary areas. Gullfaks has three permanent installations that have so far produced over 2.4 billion barrels of oil and over 56 billion cubic meters of gas. Statoil is the operator of the license, with a 70% interest, along with Petoro (30%). The Gullfaks discovery follows two other recent massive discoveries in the North Sea: Johan Sverdrup and King Lear. 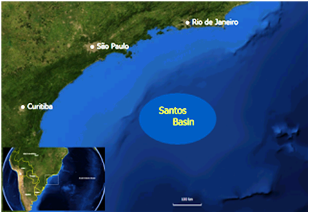 In May, Petrobras doubled the estimate for its Libra field to 12-15 billion barrels. This makes it Brazil’s largest ever discovery. Brazilian officials say it could easily produce a million barrels of oil per day once it is fully developed—that’s TWICE the output of OPEC-member Ecuador. Production could begin in five years, with plans for up to 12-18 production vessels permanently anchored on the field, each of them pumping up to 30,000 barrels per day. For state-run Petrobras, which owns the field, it means more expenditures and more debt (and it’s already drowning). The answer: Petrobras is taking the show on the road, preparing to offer foreign investors up to a 30% stake in this amazing prospect. (The Libra auction will take place in October, and 70% of the field will be up for grabs). We can’t get enough of Anglo-Turkish Genel, which is advancing like a hurricane in Kurdistan (discovery after discovery and amazing drilling success), and also faring nicely in Africa. Shares in the company have advanced almost 50% over the past year on success in Kurdistan, and now it’s about to hit the roof as its crude oil pipeline nears completion and is slated to start pumping crude to Turkey by the end of September. There is a short window of opportunity here to get in while this is still a bit undervalued. (And there are a number of undervalued stocks operating out of Kurdistan). Genel is the largest producer in Iraqi Kurdistan, and its holdings are impressive. We’re talking about 7 production-sharing contracts with some nice geological diversity. Its largest producing fields in Kurdistan are Taq Taq and Tawke, which have an estimated gross proven and probable reserves of 1.4 billion barrels of oil and gross proven, and probable reserves of 1.9 billion barrels. By 2014, Genel is aiming for a production capacity of 140,000 net bopd. Anadarko has great onshore assets in the US Gulf of Mexico and diverse offshore, deep-water assets off the coasts of Algeria, Ghana, Mozambique, Brazil, China, Indonesia and New Zealand, with proven oil and gas reserves at about 2,560 million BOE as of end 2012. We’re looking at liquids-natural gas ratio of 46%-54%. For 2012, Anadarko saw a 10% increase in overall production. This year, Anadarko plans to spend some $5.5 billion developing its onshore US assets alone, and about $1 billion on its overseas plays. So we expect another nice increase in production for 2013. The company will shift its key activities a bit to account for low natural gas prices, so we’ll see more focus and money spent on the Gulf of Mexico and less at the Marcellus shale, for instance. Anadarko is trading at $86.10 per share with a total market cap of more than $43.1 billion. Back in the US, it’s more good news for Noble. In mid-June, Noble confirmed that its second Gunflint appraisal well in the deep waters of the Gulf of Mexico had an estimated gross resource of 65-90 million bbl of oil equivalent. This means Noble’s plans for a subsea tieback development at Gunflint are a green light for this year. 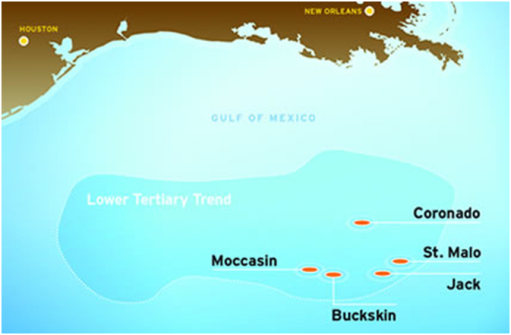 Production is targeted for the end of 2015 at both Noble’s Gunflint and Big Bend deep-water discoveries in the Gulf of Mexico. Sorry, but it’s got to be Kurdistan—again, but this time Oryx, a company we’ve written about before but you may not have heard of. If you haven’t you’re missing out. About a month ago, Oryx—the upstream division of AOG--offered up 17% of its shares (16,700,000 common shares) on the Toronto Stock Exchange for C$15 per share) with gross proceeds of $250 million. The proceeds will allow Oryx to complete its exploration and appraisal plans through mid-next year, and they expect some serious results over the next 12 months. Oryx is the brainchild of Swiss billionaire Jean Claude Gandur, who made his grand entrance onto the oil and gas scene in 2008 with the sale of Addax Petroleum to China’s Sinopec for $7.2 billion. Since then, he’s been out of the fossil fuels game—so Oryx is his re-entry ticket. Gandur owns 77% of Oryx through AOG. Oryx is exploring in west Africa and Iraqi Kurdistan, but it’s the Kurdistan assets we really like. Gandur is an excellent diplomat who can navigate power brokers, which will make or break a junior company in this territory. Oryx isn’t making any money yet, but it will, and that’s why we think now is the time to get in on this. It could very easily go the way of Addax, which was making about $300 million annually in net income when it was sold to Sinopec. Gandur has dumped $700 million into Oryx, which has been busy buying up licenses and drilling wells. It’s sitting quite nicely in Kurdistan right now with a 100% focus on oil and 143 billion bbls of proven oil reserves.